Try it yourself. FREE SAMPLE of DO Dissolved Oxygen here! Research shows that insufficient oxygen within plant root zones can reduce root growth and diminish plant productivity. Low dissolved oxygen concentration increases the time required to form roots because of inhibited nutrient absorption. As a result, there is reduced rooting percentages, reduced numbers of roots formed per cutting, and reduced average root lengths. Dissolved oxygen is essential to root formation and root growth. A picture (or video) is worth a thousand words...take a look at the exponential root development with DO Dissolved Oxygen after only 21 days! Our oxygen concentrate significantly reduces pathogens to protect tender roots. DO Dissolved Oxygen empowers your roots to grow big and strong. This is a simple experiment vividly demonstrating the effect of DO Disssolved Oxygen on the bulb size, root growth, and bud production of hyacinths. These two hyacinths are both of the same variety planted in our DIY hydroponic system, it's roots suspended in a simple glass jar filled only with water and no soil. Both have had the same amount of water, light exposure, and temperature. The only variable is the plant on the left has been given DO Dissolved Oxygen and water, while the plant on the right has been given only water. The readily observable differences are in the speed of plant growth, the stem thickness, the width and length of the roots and root balls, and the number of flowers produced. Our oxygen-rich plant additive, DO Dissolved Oxygen, is organic and safe. Containing no chemicals, synthetics, or hydrogen peroxide. These roots were grown in water and DO Dissolved Oxygen ONLY. No other nutrients or additives were used. 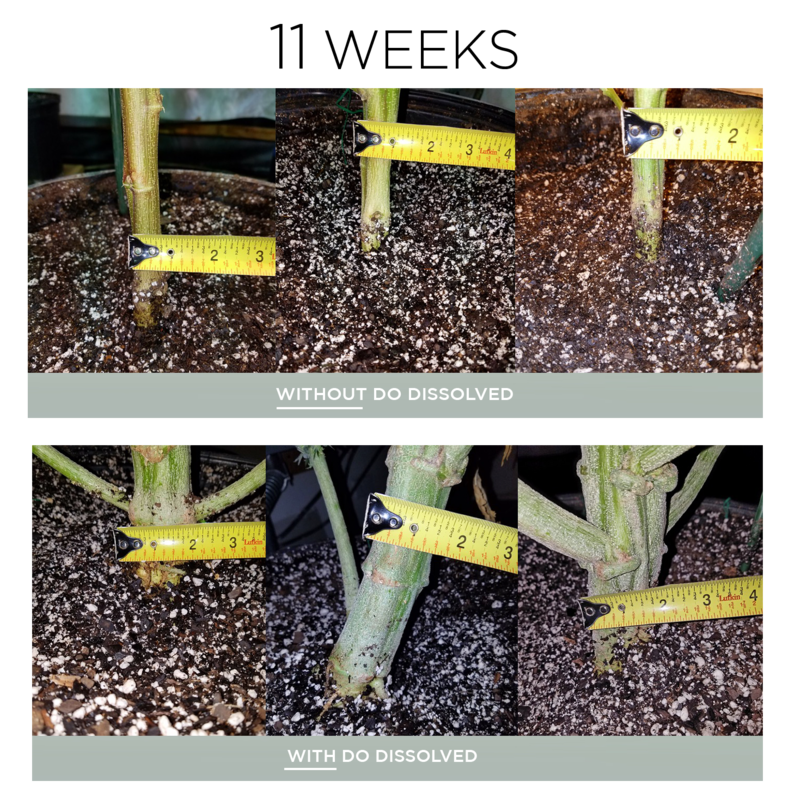 We are not suggesting to not nutrients, but by isolating the variable and only using water and DO, we show the efficacy of Dissolved Oxygen for explosive root growth.